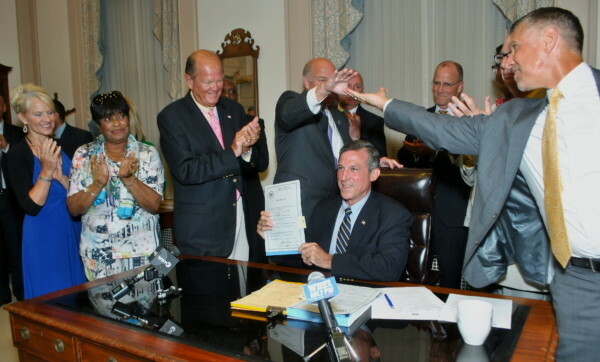 The picture of Governor Carney proudly parading a signed budget bill accompanied by applauding legislators from both parties will be one of the lasting images of Carney’s first legislative session. The smiles and the across the aisle high-fives were the climax of a contentious negotiation process that required overtime to pass a $4 billion budget and close a $400 million budget gap. Yet, outside of the circle of political insiders responsible for the grand budget compromise, you would be hard pressed to find anyone smiling about an outcome that will leave us in the same place next year. That is the seductive thing about compromise: You work so hard to achieve it that you can easily mistake process for progress. School report cards – The Delaware Department of Education demonstrated some conviction about parents’ need for information on school quality by committing to a transparent star rating system for schools (similar to rating systems used for Delaware early learning centers or for K-12 schools in Maryland and Washington, D.C.) in their draft Every Student Succeeds Act (ESSA) plan. Then they received pressure from the leadership of Delaware’s teachers’ union and other powerful voices and decided to backtrack. Their final plan ultimately included a school rating system but they compromised by creating a yet-to-be-determined “text-based identifier” for each school. These sort of vague, noncommittal descriptions were identified as problematic in the national feedback received on Delaware’s ESSA plan. State Board of Education – Governor Carney did not select former Delaware Association of School Administrators (DASA) President Kevin Carson as Secretary of Education, much to the chagrin of some in the good old boys’ club. Perhaps to restore balance, he replaced parent leader and DuPont scientist Dr. Teri Quinn Gray with Dr. Dennis Loftus as State Board President. Dennis Loftus served as the New Castle County Votech School District’s Superintendent in the ‘90s and led the Delaware Academy for School Leadership. Kevin Carson and former Secretary Steve Godowsky were among the crowd of folks present in Dover to celebrate Dennis Loftus’ confirmation process. It is too early to know for sure what direction Loftus will take the State Board of Education (hopefully one that prioritizes students’ interests). But if he leads the State Board like his friend Godowsky led the DDOE, it would be a return to a status quo where relationships were more important than results and accountability was a bad word. Moreover, with all of the compromises made to pass a $4 billion budget, Governor Carney’s administration could not ensure the legislature found the roughly $200,000 needed for the State Board of Education to operate independently of the DDOE. So Loftus will likely lead a less potent and less proactive State Board of Education. But maybe that is the intent. Support vs. accountability – As an olive branch to those who were not supportive of the reforms of the previous several years, Governor Carney promised to refocus a DDOE that already provided substantial amounts of support (and very little accountability) to be more about support. The DDOE’s existing supports include things such as: grants and supports to promote college access, support and resources for mentoring and induction of new teachers, professional development to implement state standards, coaching and trainings for school leaders, support for developing new career pathway programs, summer internships for teachers at the DDOE, an Executive Leadership Academy for aspiring district leaders, school health and nutrition supports, science/social studies/arts professional learning and coalitions, support for implementing world language immersion programs, and so on). Nonetheless, we now know a little more about what this “support vs. accountability” narrative looks like in practice as Secretary Bunting recently initiated a restructuring of the DDOE. It basically keeps all the same personnel in the same roles. It creates a new Wilmington-focused office (a reincarnation/rebrand of the former school turnaround office) — the Office of Improvement & Innovation — that will be led by Brandywine School District Assistant Superintendent Dorrell Green. It downgrades the work of the Teacher & Leader Effectiveness Branch and rebrands it as Educator Support and Collaboration (to be more palatable to those less interested in conversations about effectiveness). This is a team that has been responsible for work related to teacher preparation, teacher recruitment and diversity, mentoring of new teachers, school leadership support, teacher evaluation, teacher compensation, etc. It would be different if this reorganization represented a bolder strategy or agenda. Unfortunately, it seems to embody compromise rather than the type of change that will create better outcomes for students. But when we assume compromise is necessary and inherently productive we often forget an unfortunate truth: compromise favors the privileged and protectors of the status quo. Compromise is the perfect approach for those who can afford their progress to be served incrementally. It is tailor-made for those with less at stake. It is like the story of King Solomon. You are much more willing to cut the proverbial baby in half when it is not your baby. But if we are really invested in the success of the kids and communities long underserved by the education system, we need urgency and conviction. This means a clear agenda to transform the educational experiences of the precious and potential-filled students in Delaware’s education system. It should not be rhetoric meant to appease adults and entrenched interests who cannot see how accountability and support must coexist. It means demonstrating the courage to push for what is right for kids even if that means you might lose or be unpopular. There are compromisers who are masters at closing deals. But there are also compromisers with a legacy of closing opportunities for kids. Governor Carney and Secretary Bunting are early in their tenure and I believe them when they say they want to “do everything we can to lift these students up.” We are more than ready to see that happen and for them to lead with conviction for what is best for kids.